Pharmacological interventions include management of pain using medicinal preparations such as pain-relieving capsules or injections. Non-steroidal anti-inflammatory drugs - These are known as NSAIDs and are found to be effective in reducing pain and inflammation of the knee. 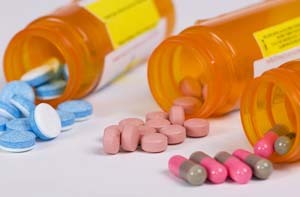 Caution must be taken while using NSAIDs for overdosing as they are known to cause hepatotoxicity. Patients with liver diseases must have extreme care while using them. They cause a range of side effects, chances of which increase with the concomitant use of diuretics, angiotensin converting enzyme inhibitors, angiotensin 2 receptor blockers, anticoagulants or oral corticosteroids. Weak and strong opioids - Opioids are prescribed when use of analgesic medications or NSAIDs does not offer symptomatic pain relief, if other treatments have intolerable side effects or in whom the surgery is delayed or contraindicated. Though they offer better pain relief they are known to cause side effects such as dry mouth, nausea, vomiting, dizziness and constipation. Overdose may lead to respiratory depression. The dose is reduced slowly otherwise cause withdrawal effects. They are also known for addiction. Disease modifying anti-rheumatic drugs and biological agents - Disease modifying anti-rheumatic drugs (DMARDs) aim at halting the progression of disease and offer symptomatic relief. Biological agents are the antibodies against the disease-causing agents manufactured using genetic engineering technology. These agents are recommended in individuals with severe disease condition.